OTTAWA - The NDP has been forced to find a new venue for next month's leadership convention to accommodate what is expected to be a record turnout. The party had initially booked Toronto's Allstream Centre for the March 23-24 event, which will choose a successor to the late Jack Layton. 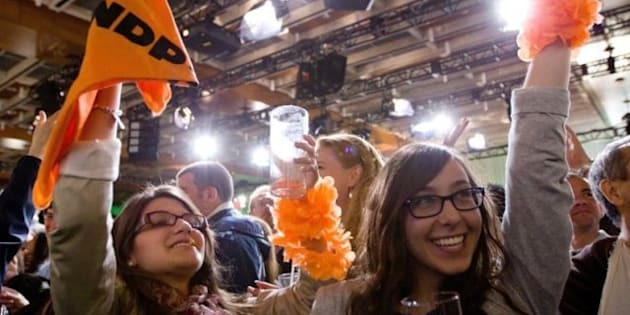 But the flood of New Democrats who've already registered has compelled the party to move the event to larger quarters at the Metro Toronto Convention Centre, which can hold 40 per cent more people. With six weeks of registration still to go, party spokeswoman Sally Housser says attendance will be significantly above any previous NDP convention. Registration already exceeds the 2,200 who attended the 2003 convention that elected Layton. Pundits have declared the current leadership contest boring, but for New Democrats, it's an historic event — the first time they'll choose a leader of the official Opposition and a potential future prime minister. "We're on line for this to be, far and away, the biggest NDP convention we've ever had," Housser said. She said registration reflects growing interest in the party since last May's election, which vaulted the traditionally third or fourth-place party into official Opposition status. "People are excited about it. This is one of the most important moments in the party's history coming up at the end of March and people want to be a part of it." Those in attendance at the convention will be only a small fraction of the thousands expected to take part in choosing Layton's successor. The vast majority of party members will vote online or by mail-in preferential ballots. For those who do attend, the convention will feature a tribute to Layton, who died of cancer last August. Before the tribute, the eight leadership contenders will be given a last chance to make their pitches to voters. NDP Leadership 5 - What does the party need to do to win the next election?